Essay from the year 2012 in the subject Communications - Intercultural Communication, grade: 1.7, Charles Darwin University, language: English, abstract: What is Identity? 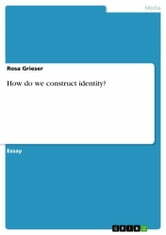 Identity as an abstracted and immaterial term or construct has been taken on by different academics. The philosophy, for instance delves into identity on a personal level and asked for 'Who am I? ', 'Where do we come from?' and 'How do we think?' (Hoffmann:2010:70). The psychobiology assumes that some parts of our identity are pre-determent by our RNA, a part of our identity would therefore be a mixture of our parent?s ones (Barkhaus:1996:31-38). Academics of pedagogic and education are interested in the process of selfdiscovery within the puberty (Osterloh:2010: 31-36). There are many more schools which are dealing with identity, all of them intersect and influence each other. The perspective of the Culture Studies1offers in matters of identity multiple approaches as it is an interdisciplinary field in which perspectives from different disciplines can be selectively chosen to observe the relation of culture and identity (Baker:2005:7). The term identity emerged during the 90s as the central theme into the cultural studies and raised the question 'What is identity?' (Backer:2005:219), in order to explain the '...consciousness of self found in the western world ...' (Longhurst/Smith/Bagnall/Crawnford/ Ogborn: 2008:142). Purpose of this paper is to use the approach of the culture studies to find out how we, as human, constructed identity. Therefore it is imported to include and analyse elements which make up identity and to embrace how we exhibit one?s own identity. 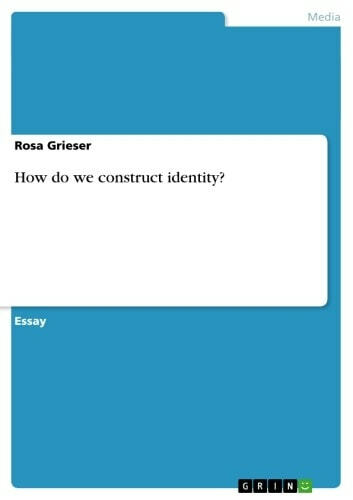 Ähnliche Bücher wie How do we construct identity? Homo Economicus - died out in the process of human evolution? Applicability of the Economic Man concept in economy and society.